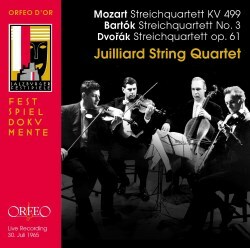 The latest in the series documenting performances at the Salzburg Festival revisits July 1965, when the Juilliard Quartet made its august appearance. They had first appeared at the festival a decade earlier, bringing a programme of Haydn, Beethoven (Op.132) and Schoenberg's Op.30. Five years later they chose Bartók's Fourth, Beethoven's Op.135 and Ravel's Quartet. After this 1965 appearance, the Americans returned only once more, in 1970, with an all-Mozart programme, a gemütlich end to what had proved occasionally combative programming. One can't quite call their performance of Mozart's Quartet in D, K499, gemütlich. In fact, reading the booklet notes proves salutary in identifying local critical disapproval of the performance. For every Erik Werba, who praised the reading as authentically Viennese, there were others who condemned its "gloominess". "We are unaccustomed to such ponderous Mozart interpretation, such merciless seriousness, and cannot agree" lectured the Demokratisches Volksblatt somewhat undemocratically. If local critics were more used to the avuncular and warm readings of ensembles like the Barylli Quartet, then they would truly be in for a shock, when the Juilliard came to town. The tremulous, contingent approach, where individual strands predominate over woolly, rich-toned central European quartets must have been a shock - though clearly not to Werba. I suspect that it's the interventionist, over-sculpted element - analytical to a fault, scientific in intent - that disturbed some listeners. It manifests itself in an insistent and rather over-prepared approach wholly at odds with the Barylli itself or - to cite just one other group active at the time - the Smetana Quartet, whose naturalness of phrasing and rhythm set them apart. It's the shackled, unfree approach that limits appreciation of this performance. It comes across as somewhat doctrinaire. No such strictures of course apply to Bartók, as the group was a great champion of the body of quartets. Their earlier complete cycle, which has been reissued in its entirety several times on CD, was played by a line-up that saw different personnel in the case of the second violin and cellist. But Robert Mann, of course, was as ever a determined primarius and Raphael Hillyer was still violist - he seemed prone to suffering string breakages, not least in the Bartók. This live performance is more expressively distended than their early 1949 recording - but then they'd played it longer and grown to conceive its parameters somewhat differently over the decade and a half that had elapsed. Its rapid disjunctions and abrasions emerge equally well in this powerfully committed reading. The final work on the programme is Dvořák's Op.61. Again, this is liable to divide opinion. For every one, who appreciates their clarity-conscious approach, others will take against the somewhat brittle and aggressive way. Always a wirier proposition than most of their rivals, they sound nothing like the Prague or Panocha - the latter's cantabile in the slow movement is both quicker than their rivals', but also even a touch more communicative and affecting. By comparison the Juilliard's aesthetic is wholly distinct; theirs is a somewhat austerely insistent way, with fast vibratos limiting the kind of tone colours and depth of corporate tone to be encountered in the two Czech groups already cited. My own colours nailed to the mast, it's really only the Bartók that appealed to me. The big hall acoustic is noticeable after fortes with ensuing silence but otherwise manages to contain the sound well. Good notes, and good remastering ensure that the performances are heard in the best light.